bond will have little or no wood fibre remaining indicating the adhesive has failed. 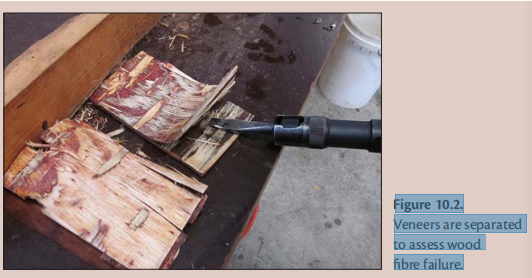 Veneers are separated to assess wood fibre failure. 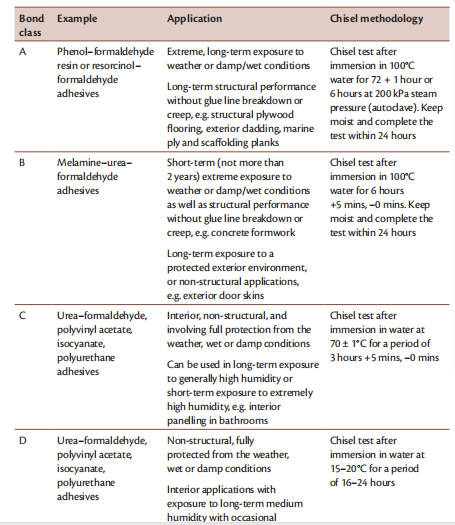 ◆ veneer case hardening or surface inactivation. and that the veneers have ‘tacked’. ◆ excessive adhesive remains present on spread veneer. long before pressure is applied. ◆ spreader roller marks are still visible on spread veneer in the failed zone. ◆ adhesive in the glue line has cured and is difficult to scrape off. the hot press before pressure is applied or loading time is excessive. problem is usually caused by drying veneer at excessive temperatures or by overdrying. force. It is this attraction that gives freshly machined wood its wettability. of course, adhesives are all likely candidates to bind with open bonding sites.